Coastal Louisiana Congressional Staff Trip – Restore or Retreat, Inc.
During the last week of March, Restore or Retreat, along with the Louisiana Coastal Protection and Restoration Authority, the Greater Lafourche Port Commission, and South-Wings welcomed six congressional staffers to Louisiana to take part in ROR’s Coastal Louisiana Congressional Staff Trip. 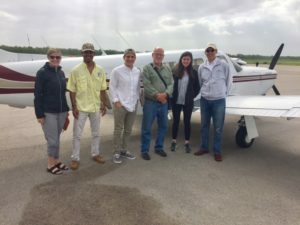 Participants of the trip included the offices of Senator John Kennedy, Senator Roger Wicker of Mississippi, Congressman Steve Scalise, Congressman Garret Graves, and House Committee on Natural Resources. The objective of this educational and field-immersed venture was to provide a solid foundation of understanding for Louisiana’s coast, the fundamentals of the environment/culture reliance, the power and dependence on the Mississippi River, and how the Mississippi River Delta supplies economic and environmental benefits to our leading oil and gas hub, Port Fourchon, which services the country’s energy industry. In order to successfully relay these primary components of the trip, the congressional staffers were given a firsthand look into our coastal crisis and methods our state has taken to address the issues—by both air boat and a bird’s eye view by coastal flight. 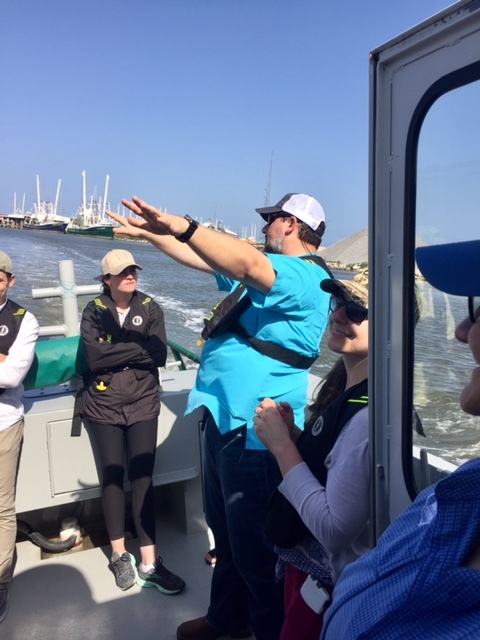 Throughout the duration of the trip, the staffers were educated on Louisiana’s land loss and flood risk the State’s Coastal Master Plan to address it; learned about Gulf-wide collaboration and federal agency involvement in the effort; and informed on the national economic importance of restoration, specifically by viewing Port Fourchon’s operations, development and involvement in restoration activities. 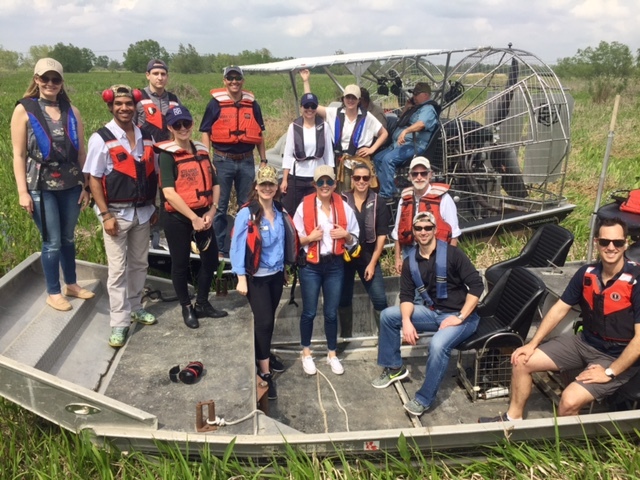 The trip began with an air boat tour of the Davis Pond Freshwater Diversion. 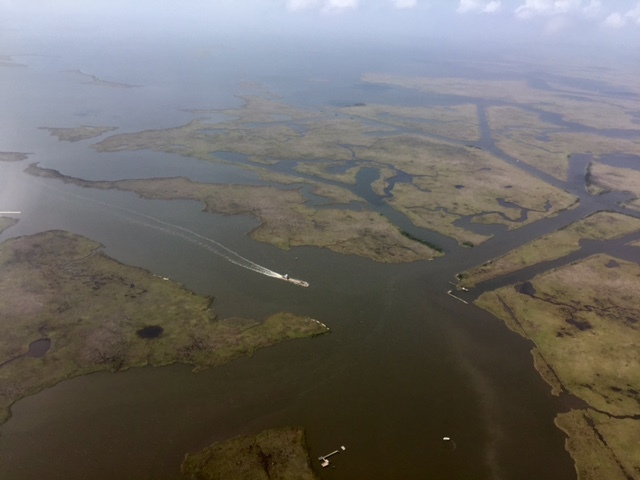 This diversion project was designed to divert fresh water, with its accompanying nutrients and sediments, from the Mississippi River into the rapidly eroding Barataria Basin—reducing saltwater intrusion and establishing favorable salinity conditions, thus combating land loss. 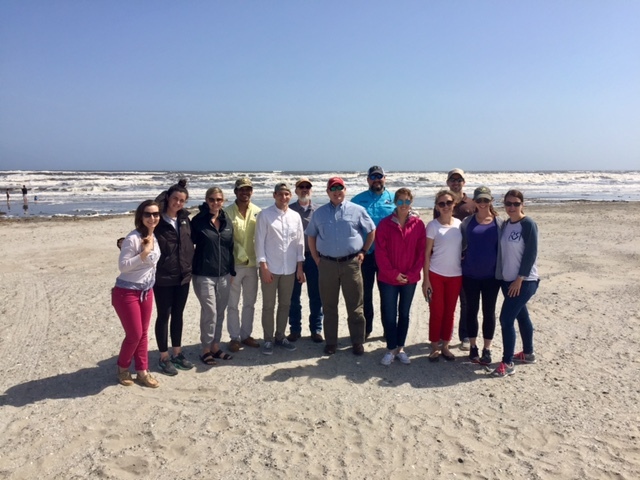 The Davis Pond tour included viewing of the outfall area, as well as observing benefits of proactive conservation management and possible legislation needed for future adaptive management and appropriations. 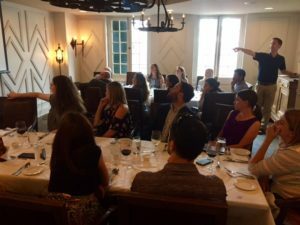 Following the Davis Pond tour was a dinner briefing of a historical overview of the Mississippi River Delta degradation and restoration by Restore the Mississippi River Delta Coalition; aspects learned from existing diversions, as well as a discussion on the effects the history has on conversation management today, potential future restoration opportunities, and possible future legislative requests by the Lake Pontchartrain Basin Foundation. Dinner concluded with a briefing on Louisiana’s Coastal Master Plan by the Governor’s Office of Coastal Actvities. 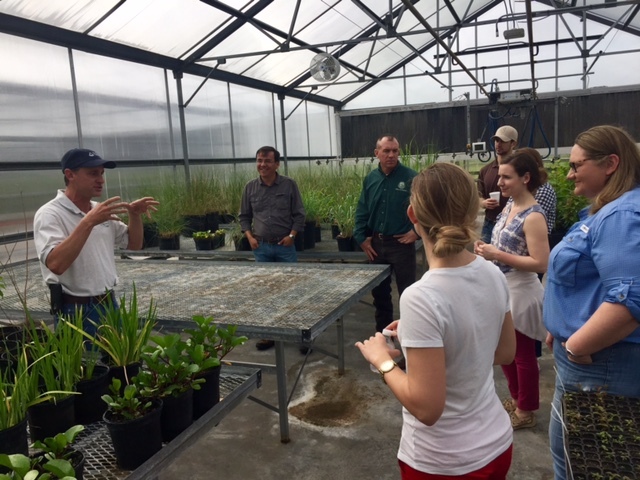 Garrett Thomassie at USDA NRCS giving tour of Plant Materials Center in Galliano, La. environmental value of the setting in which Port Fourchon is located. The Port Commission works diligently to protect and restore the coastal landscape and habitats that surround it. In between Port Fourchon and Grande Isle is the Caminada Headlands Beach and Dune Restoration Project. 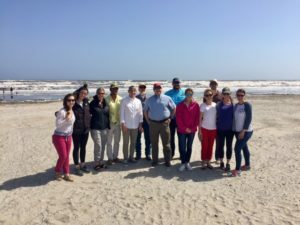 Congressional staffers were taken to the 14-mile-long undeveloped beach that stretched from West Belle Pass to Caminada Pass on the east, protecting Port Fourchon, providing critical beach and dune habitat for nesting shorebirds, and accommodating culturally significant recreational activities in the form of fishing, crabbing, and beachcombing. The trip concluded with a boat tour of Port Fouchon which gave an up-close look at current development and large scale offshore service facilities, as well as the first LNG vessel fueling station in the United States. 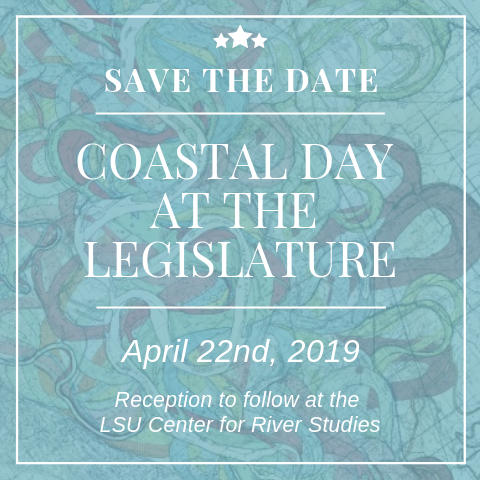 Louisiana’s land loss is severe; the projects slated to aid in our coastal crisis through the Louisiana Coastal Master Plan are critical to the sustainable and healthy future of Louisiana’s coast. 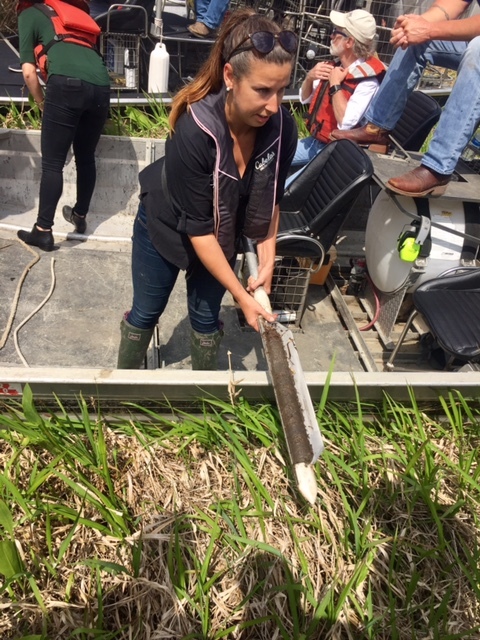 As we get closer to implementing these cornerstone projects, we want Congressional staff members to have opportunities to see the exciting possibilities associated with success of these projects, and to ask any questions about how the State of Louisiana is working with partners and state and federal agencies to proactively address stakeholder concerns.